The XpertScheduler™ tool lets you pick a task you want the system to perform and the frequency with which you want the system to perform it. To schedule a new task, click on the <Add a Task> button. This will open a new window with three drop-down menus. 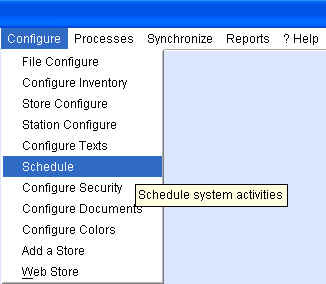 Click on the first drop-down menu, Task Selection, to see a list of system processes that can be scheduled. 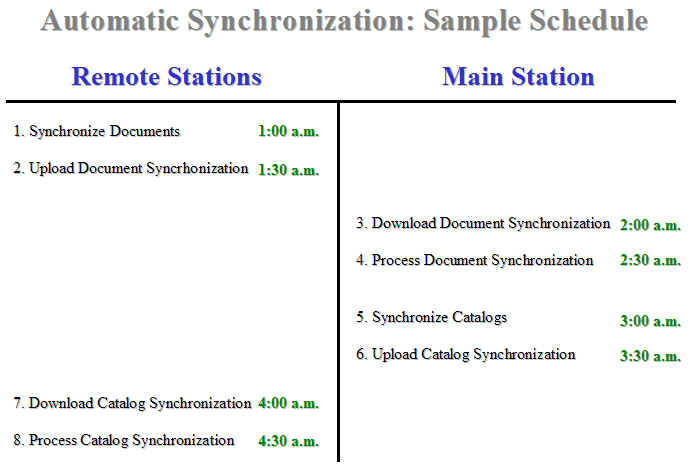 You will notice that every one of the 8 processes that make up the complete Synchronization Cycle appear as options. Select the task you want to schedule from the menu and click on the <Done> button when you are finished. If you make a mistake you can click on the <Cancel> button and pick a new task. 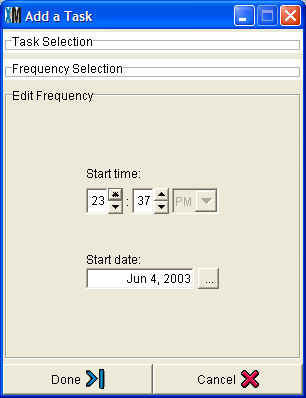 Once you have chosen a task, click on the "Frequncey Selection" field to open a drop-down menu. Tasks can be scheduled to occur hourly, daily, weekly, or only once. Synchronization tasks will likely need to be scheduled daily if not hourly while other tasks such as Updating Prices may only need to be scheduled intermittently. When you have chosen the frequency, click <Done>. The final step is to define the date and time you want XpertMart™ to begin carrying out these tasks. 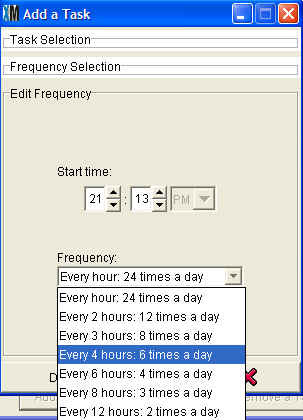 If you selected a daily frequency, then a Start time and Start date will apear in the window under Edit Frequency. When you have finished editing the frequency of the task, click on <Done> . 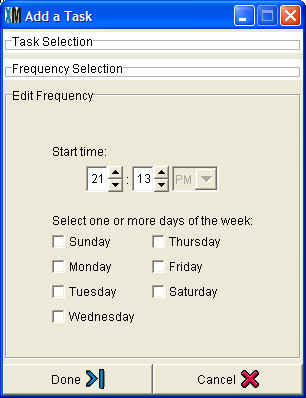 The Add a Task window will close and the task you just defined will appear in the Scheduler. IMPORTANT NOTE: For the scheduled task to take place, the computer must be on and XpertMart™ must be open. You can be doing other tasks when the pre-scheduled task is automatically performed by the system, but if XpertMart™ is not open, the pre-scheduled task will not take place. When you are adding tasks to the Scheduler you need to be careful to follow the correct sequencing so that the Synchronization Cycle is completed properly. For exmaple, you cannot have a Remote Station download catalog synchronization files if the Main hasn't uploaded them yet! The sample schedule spaces each task 30 minutes apart; it begins as 1:00 a.m. and is done beofre 5:00 a.m. You are free to design your own schedule. Plan on alloting at least ten minutes to every task. While most tasks are done in a few minutes, you want to leave yourself a margin of error. Because you are using an FTP Server , more than one Remote can be uploading and downloading files at once. So there is no need to space your stores apart: all can be synchronizing at the same time. You can schedule more than one complete Synchronization cycle to take place over night. If the system synchronizes twice in one night it will not duplicate your transactions. Duirng the synchornization process XpertMart ™ is checking for new data. If the syncronization was successful the first time around it will know that there is no new data to add the second tme around. However, if the synchronization was interrupted the first time around the data will be processed during the second cycle. If everything is configure properly, the synchronization process should be invisible to users at the stores. The next chapter explains how to monitor the synchronization on an ongoing basis and troubleshoot any problems that may arise. Every time pertMart™ synchronizes data it creates new synchronization files in the C:/Main/In and C:/Main/Out folders as well as on the FTP Server . Over time as the number of these files builds up they can slow down the synchronization process as the system checkes every file to see if the file date is after the last synchronization date . To make sure the synchronization process runs at optimal speed, you should periodically delete the files in the In and Out folder on your hard drive. The Purge Old Data process can be automated using Scheduler . A weekly purging of data on the FTP Server is suggested.